WASHINGTON, March 11 /PRNewswire-USNewswire/ -- Judicial Watch, the public interest group that investigates and prosecutes government corruption, announced today that it has obtained documents from the Federal Bureau of Investigation (FBI) detailing federal investigations into the alleged corrupt activities of Association of Community Organizations for Reform Now (ACORN). The documents reference serious allegations of corruption and voter registration fraud by ACORN as well as the Obama administration's decision to shut down a criminal investigation without filing criminal charges. The documents include background information on two specific complaints filed in October 2008 by Lucy Corelli and Joseph Borges, Republican Registrars of Voters in Stamford and Bridgeport, Connecticut, respectively, during the 2008 election season. According to Corelli, on August 1, 2008, her office received 1,200 ACORN voter registration cards from the Secretary of State's office. Over 300 of these cards were rejected because of "duplicates, underage, illegible and invalid addresses," which "put a tremendous strain on our office staff and caused endless work hours at taxpayers' expense." Corelli claimed the total cost of the extra work caused by ACORN corruption was $20,000. Likewise, Borges contended that: "The organization ACORN during the summer of 2008 conducted a registration drive which has produced over 100 rejections due to incomplete forms and individuals who are not citizens..." Among the examples cited by Borges was a seven-year old child who was registered to vote by ACORN through the use of a forged signature and a fake birth certificate claiming she was 27-years old. The FBI and Department of Justice opened an investigation. 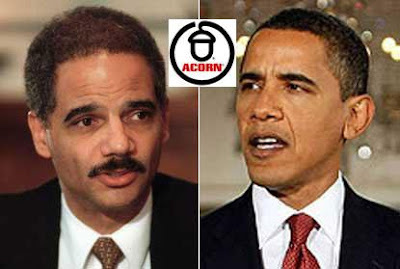 However, the Obama Justice Department, while noting that ACORN had engaged in "questionable hiring and training practices," closed down the investigation in March 2009, claiming ACORN broke no laws. By contrast, the documents also include records related to a federal investigation of ACORN corruption in St. Louis, Missouri, involving 1,492 allegedly fraudulent voter registration cards submitted by Project Vote, a liberal non-profit organization affiliated with ACORN on voter registration drives, during the 2006 election season. Assistant United States Attorney Hal Goldsmith initiated the investigation with "concurrence" from the Department of Justice and the participation of the FBI. According to a Justice Department memo, Goldsmith "advised he would prosecute any individual responsible for submitting fraudulent voter registration cards." Goldsmith identified the statute for prosecution: Title 42, USC 1973 (gg), which provides for criminal penalties for fraudulent voter registrations. In April 2008, eight former ACORN employees from the St. Louis office pled guilty to voter registration fraud. Other documents show that the Bush Justice Department failed to prosecute ACORN voter registration fraud of non-citizens in Phoenix, Arizona in 2007 because the allegations that led to the opening of the investigation were "unverifiable." Notably, the FBI document detailing this questionable decision reveals that a "draft Intelligence Bulletin... concludes that ACORN's employment practices perpetuate fraudulent voter registration." Visit www.JudicialWatch.org to read the ACORN documents obtained by Judicial Watch.